Uncork the delicious ruby-red Beaujolais, peel open the two large milk chocolate Eggs and share out the rest of the tempting goodies this Easter. Mini chocolate Easter eggs made from solid milk chocolate. Wrapped in green foil. These economical mini Easter eggs are sold in bulk for use in Easter egg hunts & Easter themed events. Mini chocolate Easter eggs made from solid milk chocolate. Wrapped in gold foil. These economical mini Easter eggs are sold in bulk for use in Easter egg hunts & Easter themed events. Mini chocolate Easter eggs made from solid milk chocolate. Wrapped in a mix of colourful foils. These economical mini Easter eggs are sold in bulk for use in Easter egg hunts & Easter themed events. Colours & quantity may vary. Foil wrapped, milk chocolate Easter chicks. These novelty, milk chocolate Easter chicks are ideal for Easter, children\'s parties and themed events/promotions. Foiled high quality milk chocolate on a card base. Mini Easter eggs individually wrapped in colourful foils, each with its own delicious filling in milk, dark and white chocolate shells. These luxury mini Easter eggs are sold in bulk for use in Easter eggs hunts and gift bags for token Easter gifts. Made from high quality milk chocolate. These brightly foiled, hollow, Easter eggs measure 6.5cm. The size of a large hens egg and with pretty designs of spring flowers, Easter bunnies and chicks. Colours can vary. These cheeky chicks get everywhere! Soft felt Easter chick stickers to add to crafts, collage and cards. 15 assorted designs. Size 45mm-50mm. 90 stickers per pack. Create your own brightly coloured Easter chick decorations. Each mix and match kit includes enough foam pieces and accessories to make 6 decorations. Includes ribbon. Size 12.5cm. Perfect for Easter treats! Assemble then decorate these wooden baskets with acrylic paint and stickers. Fill with shredded tissue then add chocolate eggs or treats. Size 13cm x 10cm. Foam Easter buckets with moveable handles. Add the foam pieces and wiggle-eyes then fill with shredded tissue and treats! 3 assorted. Size 10.5cm x 9cm. Our Super Easter Mix Hamper is a FunkyHampers exclusive gift and has to be one of the largest Easter Gifts around. 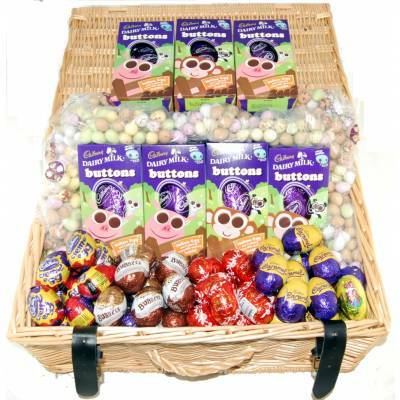 Inside the hand made wicker hamper you will find a huge mixture of Easter treats including, 1 Kilo of Mini Eggs100 Small Eggs - Cadburys Creme Egg, Caramel, Galaxy, Lindor etc7 Large Cadburys Eggs A great gift for a family or office or even a really hungry individual or couple.